In Lebanon, wireless network names, can be used for advertising. What I am about to talk about now, is beyond the expertise of any advertising agency. 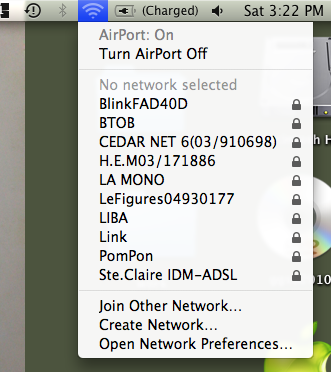 Wireless network name (SSID) advertising can only be witnessed in Lebanon. Scanning your airport for wireless network names, almost anywhere in Lebanon, will automatically result in grabbing hold of a bunch of random phone numbers instead of wireless network names. Make sure to limit your wireless network name to around 20 characters; as it should fully appear in the wireless scans. It is advised to put a website address instead of a phone number, it will grant the user access to more information about your offerings, (and if he is interested, he could then refer to the contact details on your website). So, what shall we label this advertising strategy? hahaha I must admit, I got lost. I did not know where to classify this :) "only in lebanon" for sure, Offline or Online marketing... hmmm I went for offline, but it really is in-between. haha "Only in Lebanon" is right! This sure is something! creative, isn't it? :) I would be curious to know if they actually get phone calls from this. hahaha im gonna try it! i'll let u know the results! :D haha looking forward for the results!